It seems like it has taken forever, but we finally have ripe tomatoes to pick from the garden. We’ve had peppers for a while now, but despite the fact that we have many tomatoes, they simply wouldn’t rippen. Here we have some of the fruits of our labors. Front left is a Cherokee Purple variety that we love for it’s flavor. Front right is an heirloom Hungarian Heart tomato which is new for us this year. We haven’t tasted it yet (tonight for dinner! ), so I can’t tell you about it yet. 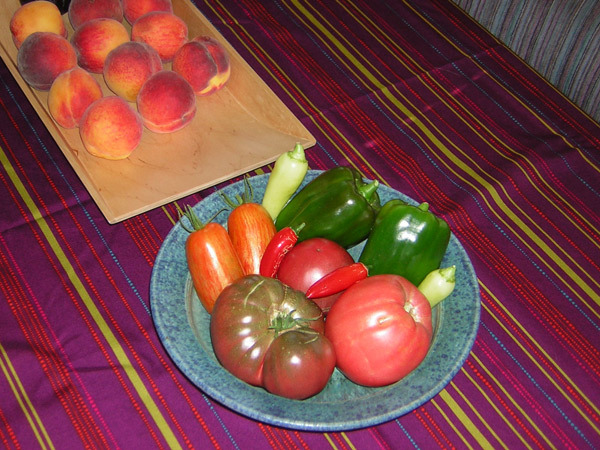 The gorgeous orange/red stripped tomatoes behind and to the left of the Cherokee Purple are an heirloom Italian plum variety called Speckled Roman, a cross between something called an antique Roman and another variety called Banana Legs. We’re gonna eat those tonight too. You can also see some red serano chiles (my serano plant is doing fabulously this year) along with some yellow hot peppers and some sweet bell peppers. What you see in the back of the photo is the evidence of yet another trip to the roadside stand with the Michigan peaches. What can I say? Oh, and we did buy some really good, freshly dug, russet baking potatoes that had just come from the farm. You can always tell a really fresh potato because they are hard as rocks and very heavy. Wrapped in foil, two of them are tucked in for a long bake in the oven even as I type this. I adore baked potatoes for dinner and tonight will be a treat for both of us. OK, it looks like I am quickly becoming something of a knitnut. Maybe it’s because most of my life I wished I knew how to knit and now that I am actually doing it, I can’t believe it. Or maybe its the pace and rhythm of knitting that is so appealing to me. 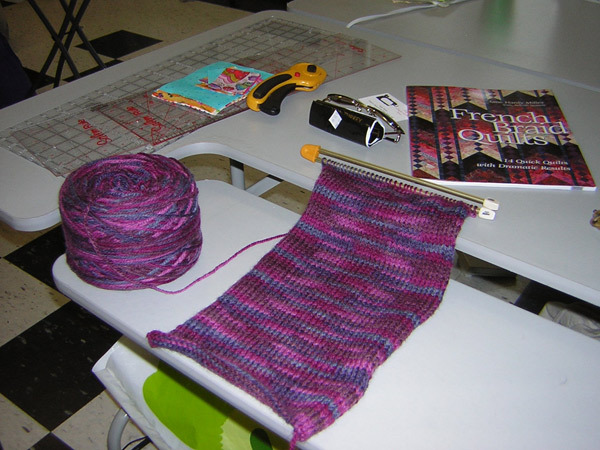 Maybe it’s because I find knitting to be a completely absorbing and totally relaxing hobby. Maybe it’s just the sparkle and shine of a new toy, a new infatuation. Perhaps it’s some undecipherable combination of all of the above. Whatever it is, I’m pretty much hooked. H said to me something along the lines of “Is it good to have 5 projects all going at once when you are only a beginner?” A valid question, to be sure. But since when I have always taken the most rational approach? Last night my friend Anne came over after work and we had dinner together and she and I took off to check out the Yarn Cafe in Maple Grove. The web site looked so interesting. Sadly, the store, for the most part, left me unimpressed and uninspired. Oh, don’t get me wrong, the staff lady was very nice and very helpful. But, for instance, we were there to buy some double-pointed knitting needles because my friend was going to show me how to start making socks. They didn’t have the first pair of size 1.5 or 2s in the whole store. They had a few 0s and 1s, but then most of their stock jumped to size 3.5 or 5. And the selection of sock yarn? In a word, disappointing. No, that’s not emphatic enough. Dismall – that’s better. We soon left and after calling and making a few wrong turns, ended up at Amazing Threads which completely lives up to the expectation implied in its name. I saw at least two dozen things I really, really, really wanted to buy. And the most scrumptious, delicious, feasting-on-color selections of yarns I’ve encountered. Never mind how far away it is from me (and it’s not that bad since it’s a straight shot up 169), I am craving to go back to this shop again. Two of the nicest and most helpful salespeople I’ve encountered lately combined with the stunning collection to create a true experience. You can rest assured I will be back there to shop the next time I need yarn. I will still shop at Needlework Unlimited in Edina simply because they are close, convenient, have a huge selection, and I have their frequent-shopper card. Meanwhile, in for a penny, in for a pound. I’ve contacted The Knitters Guild and plan to attend their September meeting and maybe even join – especially now that I am re-upping with my fiber groups like Minnesota Quilters. Yesterday my copy of this book arrived and I’m enjoying reading it and getting ideas for future patterns. iPod cozy anyone? I’m still waiting on Debbie Bliss’s Baby Knits for Beginners to arrive after looking at my quilt buddy Karen’s copy last weekend on the quilt retreat. But I really need to get back and finish those three scarves I have going on, the Einstein Coat from Sally Melville’s book and the socks I got started last night. Oh, and how could I forget. Three news sites to report are now in my favorites. But I’m not obsessive-compulsive about this knitting thing, right? 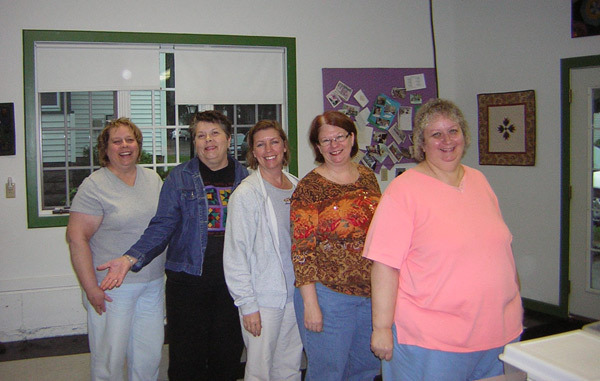 These are “the women in my life” – members of my small guild, Frayed Edges. I have such a good time with them when we go on our annual quilt retreat to Gibbon. Alas, this may be our last year as Gallagher’s Retreat Center is up for sale. I just got home from this year’s event and I had a wonderful time. I love these women and I love being around them. And the quilt retreat is such a special event. Only two days for me, mid-day Friday to Sunday, but no phone, no televisions, no radios, no computers, no responsibilities. Two days of completely self-indulgent sewing (and in my case, some knitting too!). On Friday night, we drove to Bird Island to a little shop called Gathering Friends, that really has a fantastic selection of fabrics. And they sell yarn too! I saw this Plymouth Yarn Outback Wool in a purple variegation and I had to have it. I started in on a scarf for myself and this is as far as I got before leaving today. But doesn’t it work up beautifully? 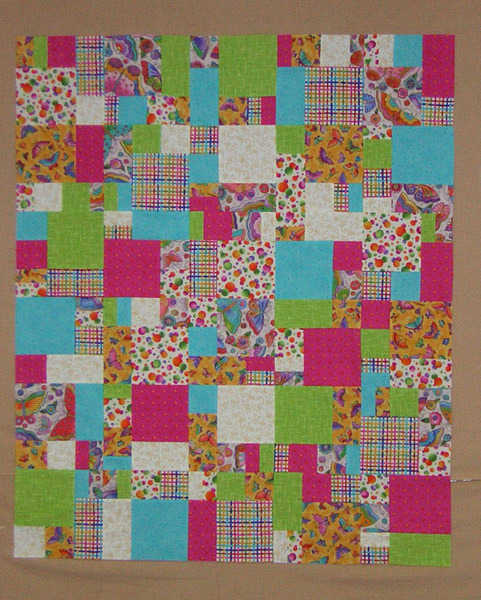 I did finish making the top to a baby quilt from a pattern I bought at Gathering Friends last summer. It was quick and easy and just the kind of thing I wanted to work. Nothing too complicated or challenging at the moment, thank-you-very-much. 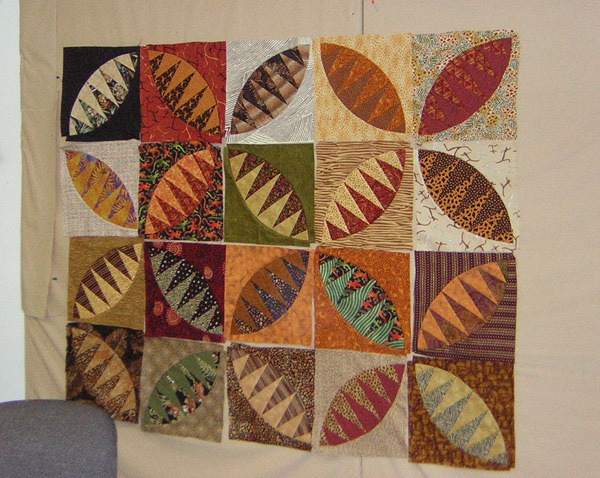 My friend, Joan, is making this Karen Stone pattern and these are the blocks that she got done this weekend. It’s going to be a stunning quilt when it gets done! Here is what was left after we got done eating and freezing peaches last night. Now being the good southern boy I am, you must know that I love a truly good peach more than just about anything else in the world. Alas, there is a dearth of such fruit to be found in Minnesota. It’s one of the few unfortunate things about living here. 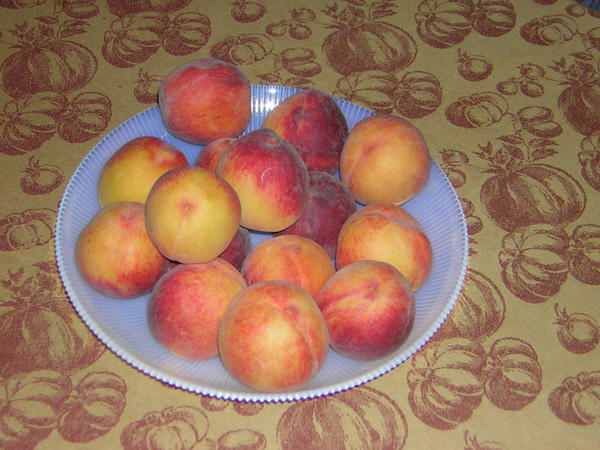 Normally, I find some relief in good Colorado peaches that I get at the local farmer’s market. But even those have been a disappoinment so far this year. So it was no small joy when Harald called me from his cell phone yesterday to tell me he saw a roadside stand with a sign advertising a truckload of Michigan tree-ripe peaches. With some skepticism, I told him we would drive out there after work to check it out. After arriving, I told the saleslady I didn’t want any mealy peaches with no flavor and she laughed and said “I wouldn’t do that to you!” as she reached in the box and grabbed a peach and sliced off a generous portion. There is no better sales tactic than getting customers to try the merchandise first, especially when it comes to food. We bought a case and when we got home promptly ate more good peaches than I’ve had over the entire last decade. I decided that freezing some of the peaches would be a good idea, since in the dead of winter we can pull out some delicious fruit when no decent peach is to be found. These weren’t as large as those splendid South Carolina peaches I remember from my childhood, but they were the perfect marriage of tart and sweet and they were perfectly ripe all the way to the core. I thought you would enjoy seeing these splendid specimens, Red Haven peaches, from Eau Claire, Michigan. 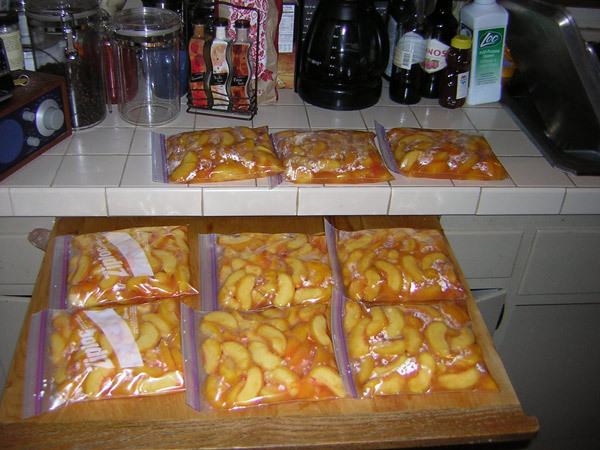 Our prepped peaches ready for the freezer.